Teacher-turned-White House-insider Evelyn Lieberman, '66, returns to her alma mater on Wednesday, April 1, at 7:00 p.m. to present "This American Life," a behind-the-scenes look at her work in the highest levels of government with the biggest names in American politics. The presentation, which is free and open to the public, will take place in the Burchfield Penney Art Center’s Peter and Elizabeth C. Tower Auditorium. A question-and-answer period will follow the talk. Lieberman has led the quintessential American life—blessed with the guidance of a strong mother, a sound public education, the will to make the world a better place, and the freedom to turn her aspirations into reality. As the first-ever female to be named White House deputy chief of staff, Lieberman served as a key adviser to President Bill Clinton and Chief of Staff Leon Panetta. She also served as assistant to the chief of staff in the Office of the First Lady, advising Hillary Clinton. Later, she was appointed adviser to Secretary of State Madeleine Albright. 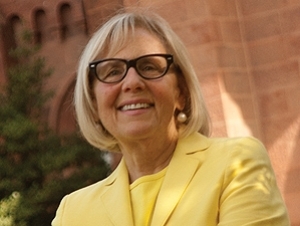 Today, Lieberman serves as director of communications and external affairs for the Smithsonian Institution, the world’s largest museum and research complex. Lieberman’s presentation will offer inspiring stories and recollections from a remarkable life in public service—a life that came about a bit serendipitously. After earning her bachelor’s degree in education from Buffalo State, Lieberman taught high school English in Hicksville, New York, for four years—but an unforeseen move to Washington, DC, prompted a career change. After obtaining a job as a librarian at Georgetown University, she established a network of connections that led to public relations positions at the Housing Opportunities Council, the National Urban Coalition, and the Children’s Defense Fund, all high-profile national advocacy agencies. An invitation to serve as press secretary to then-Senator Joe Biden followed, launching her career in government. Lieberman’s presentation is sponsored by the Dr. Paul G. Bulger Lecture Series.